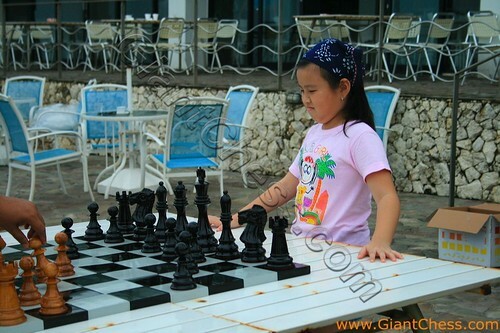 Play chess game outdoor is an interesting activity in your holiday. Chess is a game for all ages, children, adolescent and adult. Usually people play chess in their house or indoor room. But to get new environment and nuance you can move your game to outdoor area, such as at your garden, backyard, beside your swimmingpool, hotel balcony, or also at the beach. You game will more interesting to do at different space as usual. The picture above show you about a girl who think about her strategy to move her chess piece. She play with her chess partner at a beautiful beach. She want to have something different to fill her school holiday and go to beach. Her holiday more interesting with chess game and she enjoy it. You do not need to worry about chess pieces damage because those are made from Teak wood and polished well, so that the products are very durable and attractive.